The Gilles Villeneuve Circuit is located at Parc Jean Drapeau on Ile Notre Dame in Montreal. The race track earned its name from the ever popular Quebec Formula 1 driver Gilles Villeneuve who lost his life in Belgium during qualifications. 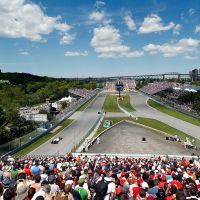 It is with enjoyment that the fans of motor racing can attend the events as Grand Prix of Canada of Formula 1 and the series Nationwide, the American category of Nascar.